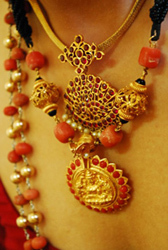 Coorg jewellery is very distinctive, yet the influence of neighboring States is evident. The jewellery worn by the Coorgs are inspired by nature, in the form of flowers, fruits, serpents, the moon, sun, and stars. 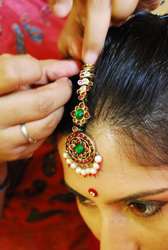 The 'Karthamani' and 'Pathak' are both symbols of marriage in Coorg. The former, fine black beads strung on a gold chain, sometimes made with as little as two grams of gold are common to both South and Western India. The ‘Pathak’ is usually a half sovereign, or a larger gold coin, engraved with Goddess Lakshmi or Queen Victoria, framed by rubies, surmounted by a cobra, with hanging fresh water pearls, and a chain of gold and coral beads on a twisted strand of black glass beads. 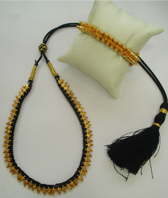 The 'Jomale' which consists of gold moulded grooved beads strung on black cord, about 71 cms long, is a necessary part of a Coorg bride’s wedding jewellery. The hollow beads are filled with lac. Nowadays, the Jomale is strung on different coloured threads to make a fashion statement. 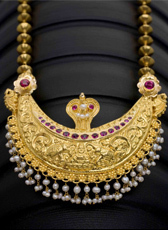 The 'Kokkethathi', a crescent shaped repousse pendant set with graduated cabochon rubies, framed with sea pearls, filled with lac, and a chain of ' Gund ' or hollow gold beads, is mandatory for a Coorg bride. The pendant has the image of a seated Lakshmi, Goddess of Wealth, flanked by two birds, by a cobra with a distended hood, which is a multiple symbol of wealth and fertility. The chain is usually 26 inches long to show it off to advantage. 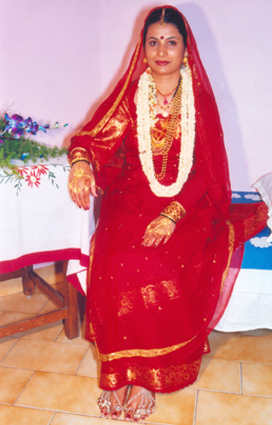 The Coorg bride has a choice of beautiful bangles – The 'Kadagas' are gold hollow bangles, that literally clasp the wrist. They could be made of a single, double or triple bands of gold ornamented with twisted gold wire and rubies. The 'Paunchi', which has gold grains in two or three recurrent rows, is a work of art, as is the 'Vajrachudi', which is supposed to represent jackfruit. 'Pimbale', and 'Piribale' are simpler gold bangles. The Coorg head ornaments, are of South Indian origin. The main head piece usually has Shiva and Parvathy with Ganapathy, and the ornament is made to stay firm, with three strands of hair woven through a slit in the jewel. The 'Jadaenagara', includes the ‘Suryamukhi' and the 'Chandramukhi' and the 'Kutchu' of 3 black strings, ornamented with gold which hold the plait in place. As the bride walks to the 'Mantap', or stands for the Ganga Puja, her feet are very much in focus. The jewellery she wears on her feet, in silver, are special to Coorg and represent the finest craftsmanship of the local jewellers. There are individual toe rings attached to chains, linked to the ankle chains all of which are finely crafted. The earrings could be 'Jhumkis' , 'Muravu' or 'Bogadi', all of Carnatic origin, and mostly gold, ruby and pearls. The repousse work commonly used in Coorg jewellery , uses a small quantity of metal, beaten to paper thinness, to convey an impression of weight and solidity, and a three dimensional effect. The Coorg sari needs to be pinned with a 'brooch' – and that has spawned a special set of ornaments. Very popular are miniature ‘Peeche kathis' and 'Odikathis' , the ornamental knives, men wear on special occasions. Many old timers have 'tiger claw' brooches, from an era, when ‘Shikar’ was a way of life. 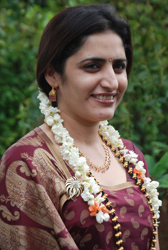 The content for this section has been provided by Chindamada Arati Monappa, textile designer, who brings out a line of clothing, sarees and accessories, primarily using natural dyes and craft techniques. She runs an eco-friendly store “Serenity” in Bangalore. 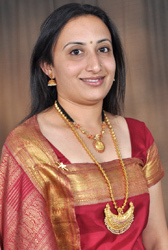 Based in Coorg, she enjoys exploring her roots and the Coorg community to which she belongs!